Are you looking for an easy side that is delicious and full of nutrients? 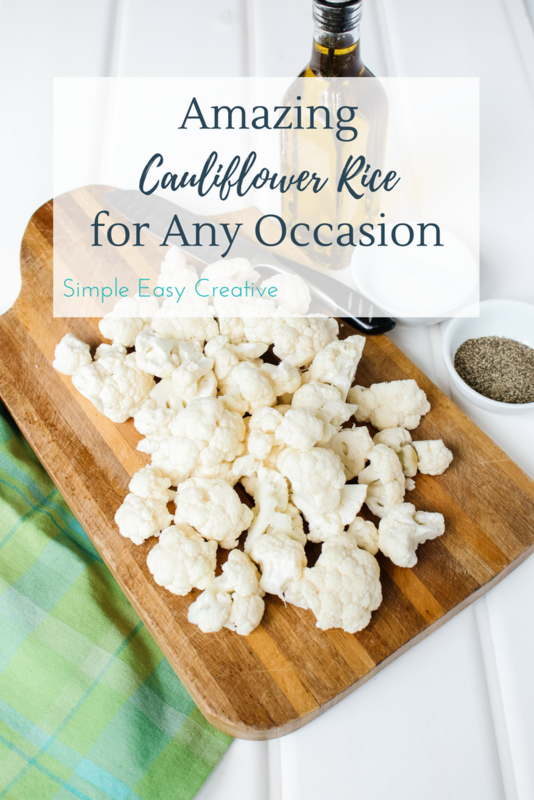 Cauliflower Rice Recipe comes together quickly and can be used as a side dish on its own, mixed with other ingredients, or even used in fried rice! As a busy mom, I always wanted my kids to eat more vegetables. But steaming or broiling cauliflower and putting it on the table was just wasting food and time. When I first heard about ricing cauliflower, I was skeptical. But I was pleasantly surprised- the texture is very similar to normal rice and the taste is so much better than I expected. This is a great side dish for those wanting to eat fewer carbs, or just add more vegetables to their children’s diet! Start by cutting your cauliflower into florets. The chunks should be small enough that they will fit in your food processor. Then put the cauliflower in the food processor – I like this one!– in batches (don’t make it too full! ), pulsing for 5-10 seconds. 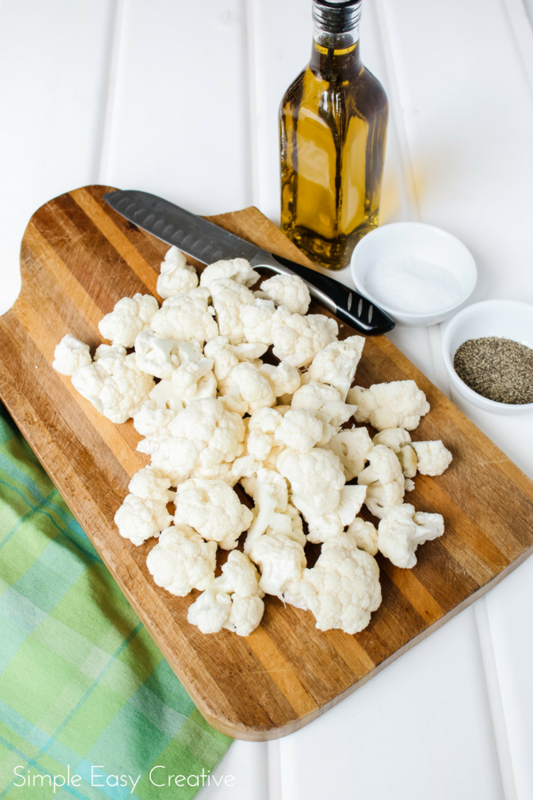 When the cauliflower is roughly the size of rice, take it out and repeat with a new batch. Make sure to only pulse- if you turn on the food processor it will turn into mush! If this happens, think about making cauliflower mashed potatoes! Heat up some olive oil over medium heat in a large skillet. You don’t need a lot, just enough to coat the bottom of the pan. Add in the cauliflower and stir to coat. Then add salt and pepper. Cook for 5-7 minutes and stir often. Make sure that it is not sticking to the bottom of the pan. And that’s it! Your side dish is finished. You can serve your rice with a little butter or soy sauce. Or, take it a step further and turn it into fried rice! 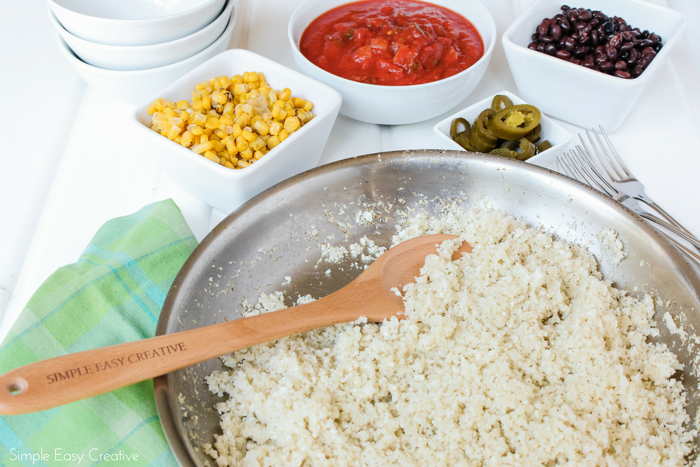 This Cauliflower Rice pairs well with these Southwestern Pork Kabobs too! I love to use the rice in rice bowls- like this one with shrimp. You could add chicken, pork, or tofu and all of your favorite Mexican toppings to have a quick taco bowl. The cooked “rice” keeps well in the fridge for a few days. I like to make a big batch and use it in a couple of meals. 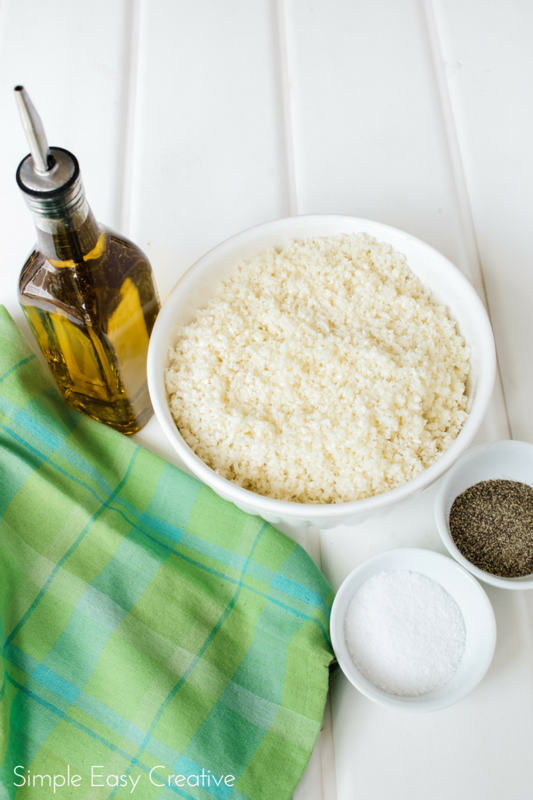 Have you ever tried Cauliflower rice? What would you use it in first?